To a medium bowl, mix together the ground beef, bread crumbs, minced shallot, garlic cloves, Italian parsley, egg yolk, crushed red pepper, grated cheese and salt. Using your hands, roll a few tablespoons (or 2 ounces) into a ball. Repeat until all meatballs are formed. You should end up with about 6 to 7 meatballs. To sear the meatballs, add a few tablespoons of oil to the sauté pan. When the oil is hot, gently add the meatballs and sear on all sides for about 1-2 minutes per side, until golden brown. Transfer them to a bed of paper towels to drain. Repeat until you've seared all of the meatballs, adding more oil if the pan as needed. Dump out the oil and in the same medium pot, add the tomato sauce or crushed red tomatoes. Add the garlic clove and crushed red pepper, and 1/4 cup of water; mix and cover the pot, cooking the tomato sauce over low heat for about 15 minutes. Add the meatballs to the tomato sauce and cook for an additional 10-15 minutes. Meanwhile, bring a large pot of salted water to a boil. When boiling, add the pasta and cook until al dente, or according to the package’s instructions. To serve, toss the cooked pasta with a few big spoonfuls of sauce. 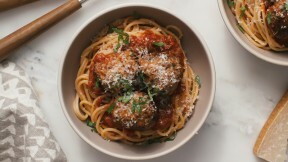 Divide the pasta between bowls, top with a few meatballs and garnish with a sprinkling of Italian parsley and/or basil and some Parmesan-Reggiano.